With a surface area of 72,500 square metres, it is the largest in Spain. The Alcazaba has witnessed the life of Badajoz from the time it was founded, and became a crucial point from which to control the Spanish/Portuguese border. The building as it stands today is the result of the changes made in the Almohade era - in the twelfth century - by Caliph Abu Yaqub Yusuf, though it appears to originate from the ninth century. 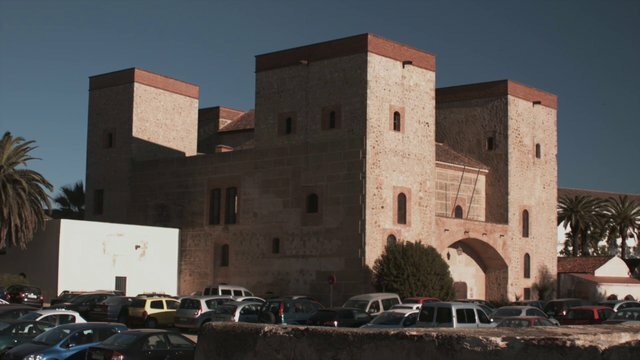 This 72,500 square metre fortress is the largest in Spain, and was deliberately designed to be impenetrable, taking advantage of the gradient caused by the River Guadiana and the Rivillas Stream. The Alcazaba was declared a monument of Historic and Artistic Interest in 1931. Today, refurbishment works are revealing new architectural details which only increase its immense value. You can enter the walled citadel through any of the four gates; the Capitel Gate and the Alpéndiz Gate are of the Almohade era and are exceptionally well conserved. The other two are the Coraxa Gate and the Yelves Gate. One of the most noteworthy towers flanking the most exposed part of the wall are the Espantaperros Tower (twelfth century) with an octagonal floor plan which predates the Torre de Oro of Seville. Inside the fortified walls, you have to see the Palace of the Counts of Roca with its arched patio (today it is the Provincial Archaeological Museum), the Alcazaba gardens, the Tower of Santa Maria which are the remains of a church built on the Central Mezquita, the Library of Extremadura or the Tower of the Episcopal Palace. The citadel also contains the Faculty of Documentation Science and Communication of the University of Extremadura. Naturally, you will enjoy wonderful views from the ramparts. You can see all the way to Portugal, and at dusk the view is particularly magnificent (this is a great time to take some photos).